← New Video: Tasting Gari-Gari kun’s Napolitan Spaghetti Popsicle! 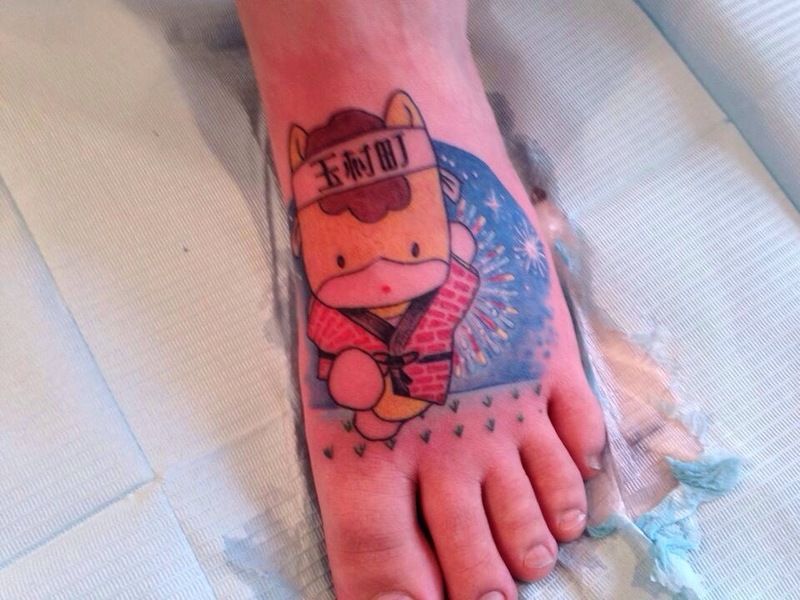 A friend recently posted the most amazing picture–her brand new Gunma-chan tattoo! Gunma-chan’s been pretty popular lately (our Gunma-chan’s Day Out video has over 5,000 views!) but this is definitely the first tattoo of our pony mascot that I’ve seen. How awesome is this? I look at tattoos as memories of times in my life so I got the mascot of Gunma to represent my time in Tamamura. I also loved that he was at the Tamamura fireworks which I went to and were amazed by. Finally, the rice at the bottom was important for me to include because I rode my bike to and from work every single day through a large rice field. In the end, I also really like Gunma-chan! He’s so cute! I’ve posted about Tamamura Gunma-chan before, and it really is one of my all time favorite designs. I don’t personally have any tattoos, but seeing this makes me tempted. How about you? Would you get a Gunma-chan tattoo? Or perhaps some other cute character? Let us know in the comments, and be sure to share this post with your Gunma-chan loving friends! This entry was posted in Art, Gunma, Japan and tagged Art, cute, Gunma, Gunma chan, Japan, kawaii, tattoo, yurukyara. Bookmark the permalink. 5 Responses to Gunma-chan Tattoo! I totally get the appeal! He’s adorable! But ouch. What a painful place for a tattoo! Isn’t he super cute? But yeah, that must be a very painful spot! I can’t imagine.